zeus is my 3 year old gsd. 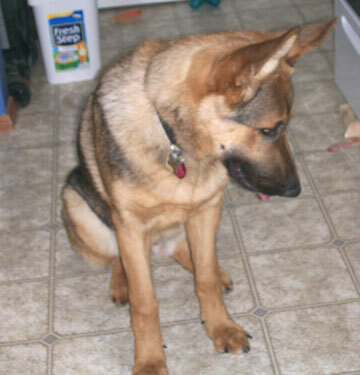 i joke about letting him making it to see 4 it was making 1 and then 2 and 3.
he is my 3rd gsd. previous were females, who were both easier to train.females hear that?! he is ultra intellegent, never had an accident, although i suffered from sleep deprevation by taking him out every 2 hours when i got him at 8 weeks. this potty patrol went on for 5 more weeks, getting longer as time went by. zeus loves to work and will become a search and res. he gets the paper in the morn and again at night. when im done with it, he takes it to next door. he carries the garbage to the dumpster and gets the mail from my rural mail box. on occasion,he drops a letter. he loves attention from adults and little kids. he shares his toys and nylabones with them. he is addicted to shperical objects. never tires can chase a ball all day. now the only problem is that he loves to go for truck rides. mention truck and he perks his ears and cant wait to get in the crew cab. now the problem is that he goes ballistic, pacing back and forth,never sits or lays down. barks at people,cows, bikers etc. he is totally hyper.